Explanation of Mask: I have always had a deep connection with the wilderness ever since I was a kid. I still feel it, I feel more awakened to who I am ever since my injury. 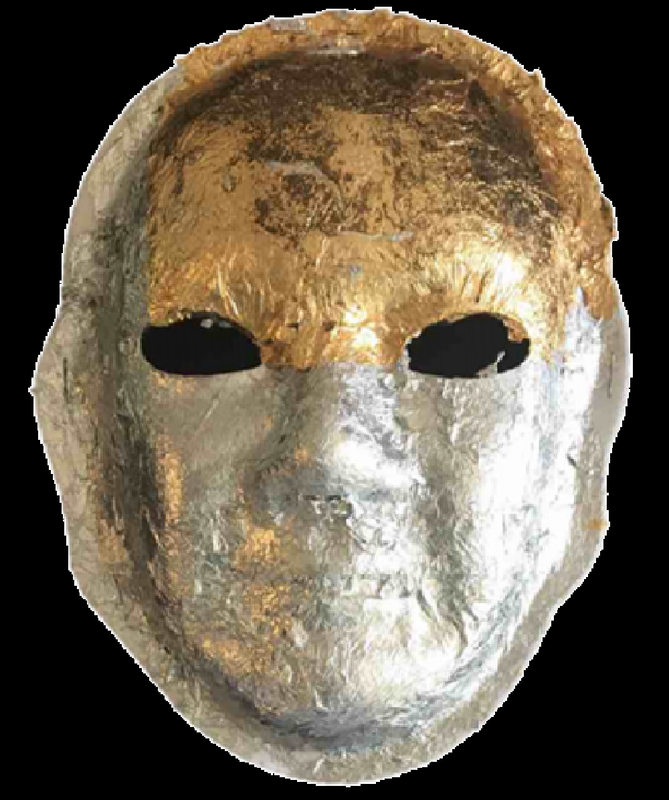 My right eye on the mask where it is bright and a sun is the eye that is still able to see. The left one is blocked by mountains, just like Colorado because it is all just black/dark to me. The sky is red- sunset red- for my frontal lobe is doing well and not damaged. I have a greater passion for life than I had before. The river for me is speaking more the truth now, I am not lying anymore. I have stars in the sky because I have always had a profound love to go out at night and stargaze- it means opportunities for dreams to come true. 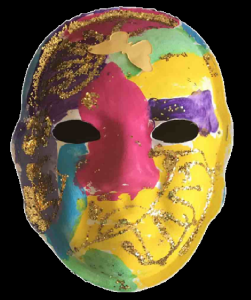 Explanation of Mask: The gold glitter is how I felt when I first came up and everything was so different – like clutter. 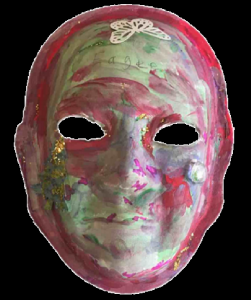 The blue around my eyes is my sadness because I haven’t been able to raise my daughter – she was only four when I had my stroke. The bronze because I am alive. 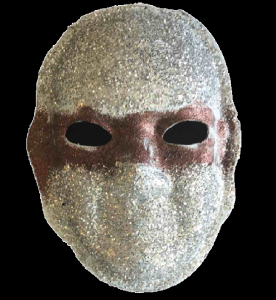 Explanation of Mask: It is my mask with glitter and glue on it. 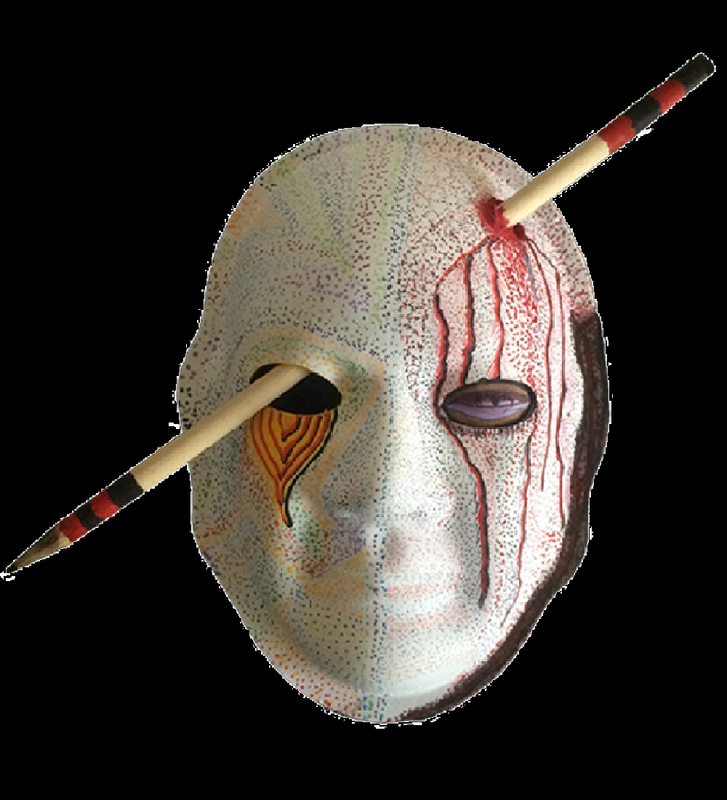 Explanation of Mask: The button represents the loss of vision in my left eye which has taken my ability to carve (I was a chainsaw artist). The red represents anger, as people have taken my life from me. 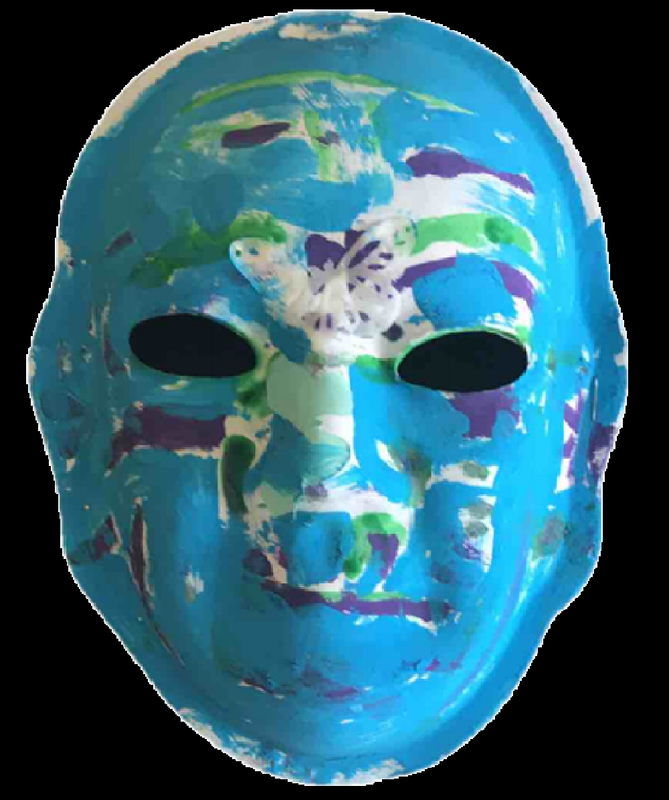 The blue area at the top of the mask with the black inside of it shows where I was bashed in the head. There is red glitter on the top half of the mask because that is where the damage was done, and silver glitter on the bottom half because that is the part that’s still pretty. Brain Injury: My first injury, I was run over by a semi. My second injury I was working on freight docks, and I was riding a bike and missed a turn and the truck didn’t see me. 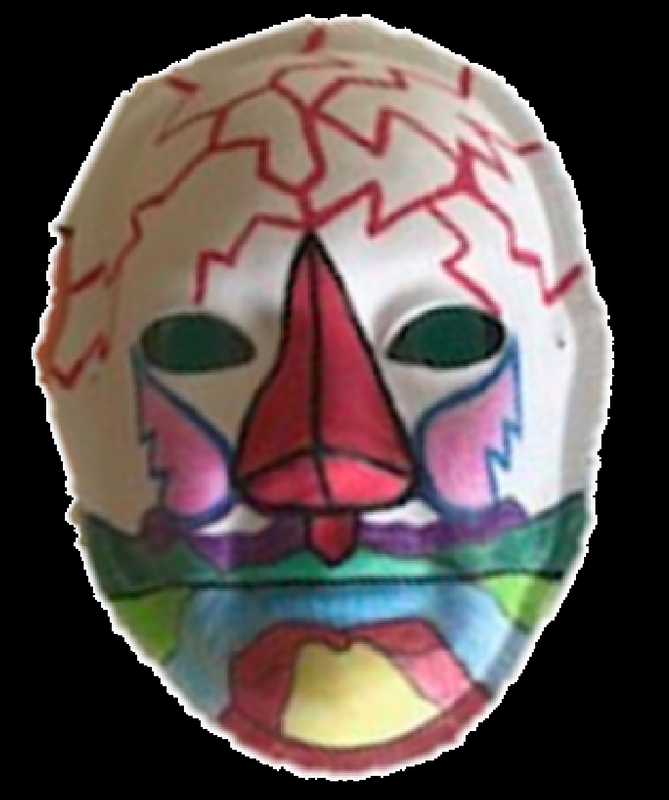 Explanation of Mask: The red is fear sometimes and sometimes mad. Native Americans are like that. My nature side came from my dad. The pink lips are because my dad was a heavy drinker. The black around head is because Native Americans have black hair. My mom did most of the raising. When I think about my brain injury, I think I mad a big booboo and I was dumb enough to do it twice – but I wasn’t drinking because I was with my kids. Because of my injury, I give more respect to other people. Brain Injury: My injury was a long time ago. I fell on a two-wheeler a long time ago. I also broke my leg. 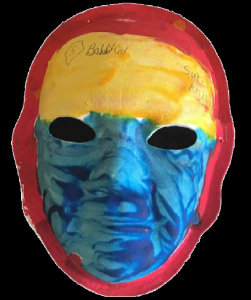 Explanation of Mask: Red is for Superman, Blue is for Superman. Yellow is for Superman. I feel like I am Superman. Brain Injury: Combat related – multiple head injuries during combat. Explanation of Mask: The flag is tattered and torn. It’s been through a lot but the purpose and intent is still there. No matter how much a flag is destroyed, it is still a flag. You can look at it and understand the feeling. True emotion spills out when you see the flag. That true emotion is not lessened by the destruction it’s been through. It’s still me, I am battered and torn but my purpose and my soul have not changed. 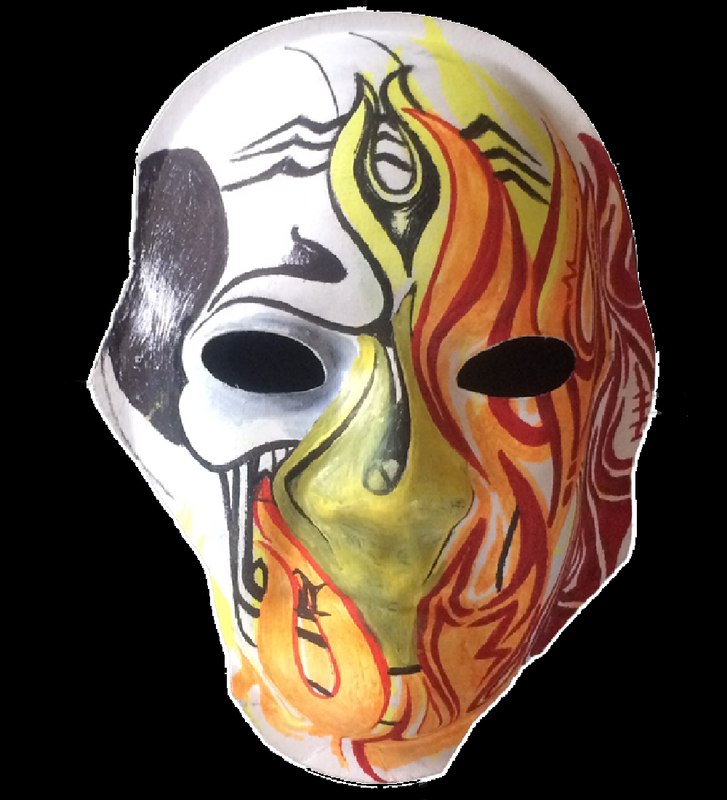 My mask represents the voice that was taken away. The flag shows that I would do it all over again. It shows sacrifice and pain. It shows patriotism and true power. A country divided, but still under the same colors. It stands for the loss I felt under it. But most of all it stands for courage. The courage to go on. The courage to fight. To not let what happened break me down. Brain Injury: I had a massive heart attack and it put me in a coma for a month. It took prayer to get me out. Explanation of Mask: The glitter I think of the sunshine that I use to be – I used to shine. The other parts used to work. The pink means I used to teach kids. The butterflies mean that most of the kids blew away. The yellow means victory and the glitter means the shining of coming out of my coma. The purple meas when I first walked again at church and everyone clapped for me. I was too excited! 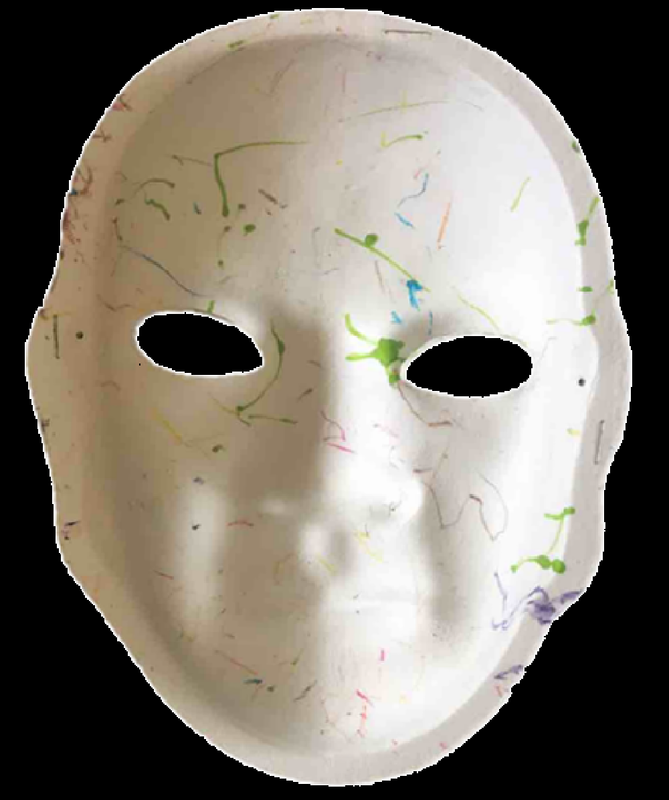 Explanation of Mask: The nose is because I can’t smell and that is a negative. The eyes are saying down. I feel very key in the top part of my brain – the orange is the honesty and the top part of it. A really wonderful thing is coming for everybody. The key is seeing things positively – something wonderful is happening in the higher dimensions. Earth details will be 3.5 to 4.5 – things are coming together. Brain Injury: I’m emotional of certain things. Me riding one of my longboards November 29, 2014 and got hit by a car. 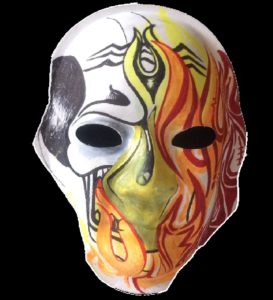 Explanation of Mask: I do like some bands, a lot I can’t make a mask of their symbol. That’s why I chose Five Finger Death Punch because their symbol is a face with a red hand and black 5 on it. Brain Injury: Car wreck; I went flying our side window. I was going 170 mph and I never wore seat belt. 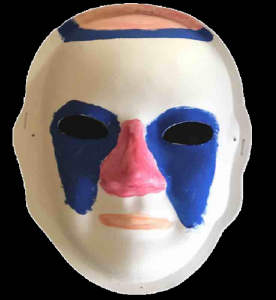 Explanation of Mask: The blue is for my blue eyes. Green is because I am Irish. The red is where I split my head open. The #26 is my favorite number because it is my birthday. Brain Injury: I was hit by a car. 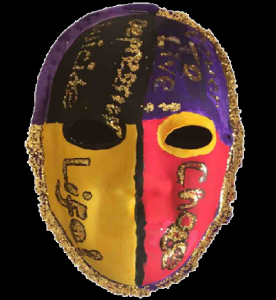 Explanation of Mask: The black is because I feel I am not heard. The green is because I am creative. I like glitter. The blue is sadness. I love music and art is great. Brain Injury: I fell 29 feet out of a fire escape at age 3. I am blind in one eye, seizures and I can’t remember things and I get confused. Explanation of Mask: The butterfly means it is beautiful. The Christmas tree is for Jesus. Red is my favorite color. The jewels is because I wear a lot of jewelry. The mouth is different colors because I like color. I feel kinda sad because of my accident. It makes me feel mad at myself and I can’t get it out of my mind. My mask is beautiful just like me and faithful, generous and awesome. Explanation of Mask: Since my brain injury, I’m more open. I’m a better person. Pink is me; everything. The black is the empty part of my brain. The heart is love. The flower is beauty. Brain Injury: I hit a concrete highway divider going 80 miles an hour (without a seatbelt) because the person merging next to me was on their cell phone. I panicked and over-corrected. Explanation of Mask: I have painted the entire mask bright gold, nothing can hide my inner bright light. You can’t get depressed if all the colors around you make you smile. That’s why I love rainbow tye-dye (not on the mask though). Pre TBI – headed up the stair steps of life – nice, neat and organized. When you are a teenager and have a pimple, you feel like it is the center of a bulls-eye on your nose. 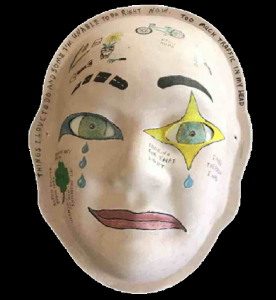 With a TBI, you often feel like your whole body is a big boiling pimple ready to explode. Chronic fatigue, uncontrollable emotions and unbelievable headaches to name a few. 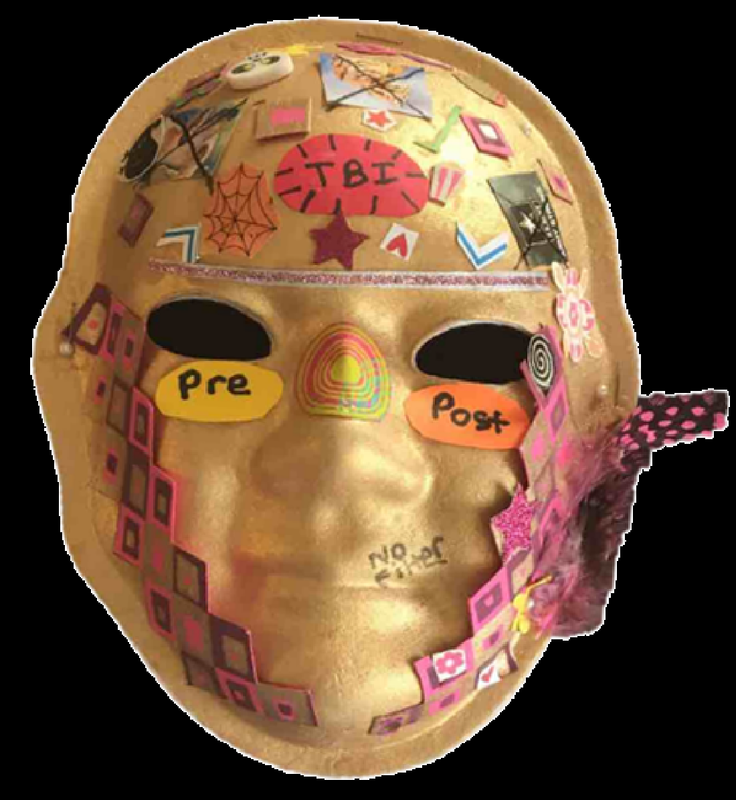 TBI – complete and utter chaos. My stair steps have blown up to pieces. I had to give up a good job at an army hospital. I had to give away my cat and dog – can’t take them with me to rehab. Sometimes I think I have cob webs instead of my brain in there. Or is it a pain empty skull in there. 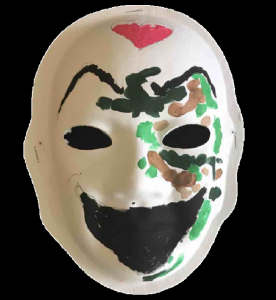 Explanation of Mask: The green is about my growth. The gold is because I am worthy. The blue means I am fluid. The speckles of white is to show water in the flow. The speckles of black is because I am partially blind from my accident. 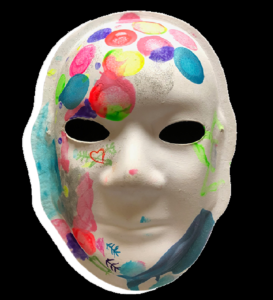 The speckles up top is because pink, blue, red, green because all of my feelings inside mixed together because sometimes I am angry, then calm going with the flow, and sometimes I am in the flow. I am funny and living. Brain Injury: 1985 – don’t remember it at all. 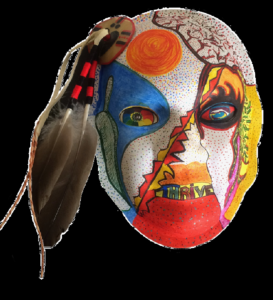 Explanation of Mask: The yellow feather means I am free. The yellow means power. The lines mean all that which has been interrupted – all that I had is gone and been interrupted. Divided in half means my previous half of power, the other half is everything I want it to mean. The labyrinth is my journey on that half. I am searching for my old life and I am on that journey to restore my life, what that might be! Brain Injury: Anoxia; without oxygen too long. I had a stroke and heart attack in May 2015. 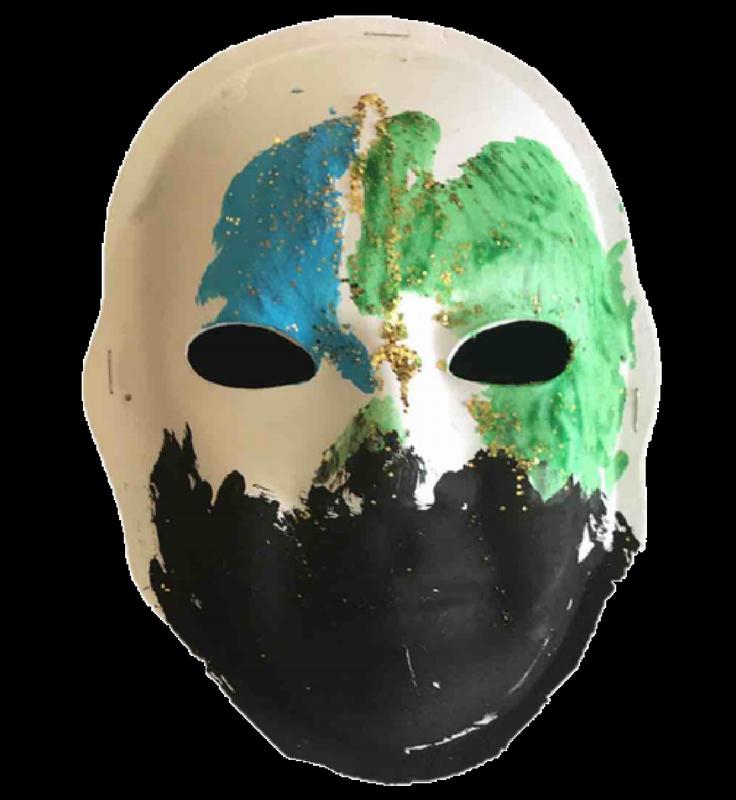 Explanation of Mask: Green- because I love and I am compassionate. Yellow- because I choose to get out of bed everyday and I choose to be confident and positive. Blue- because I am truthful and I am trying to be better at communicating. Red- because I am angry, yet I am stable. Purple- because I am aware and trying to be very connected. Pink- because it is my favorite color. Teal- because I am at peace. 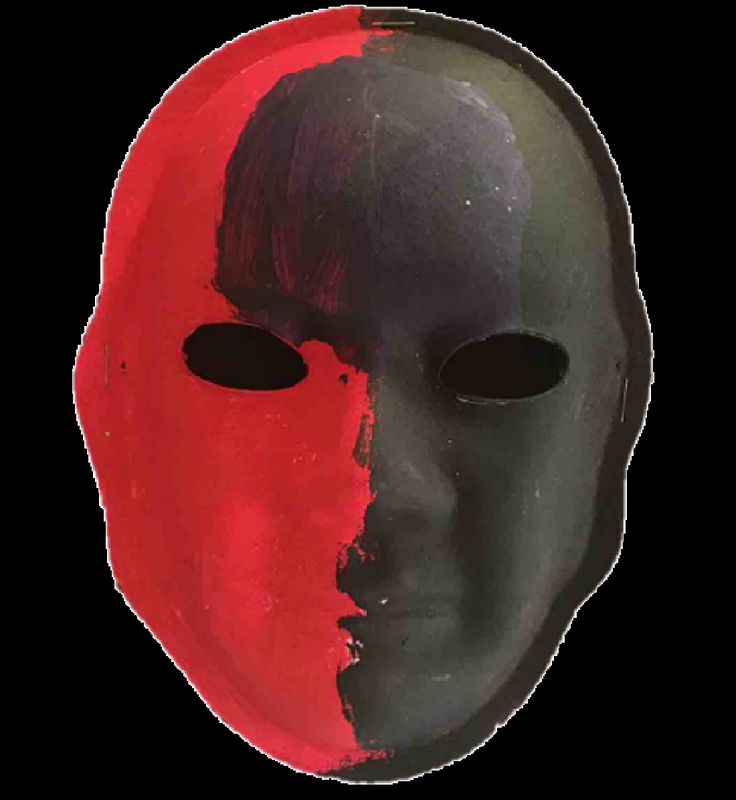 Explanation of Mask: Red is angry, Black is dark. Purple is my mind. Brain Injury: It happened when I was 18 years old. I was in a five car collision – I was at the epicenter of the collision. 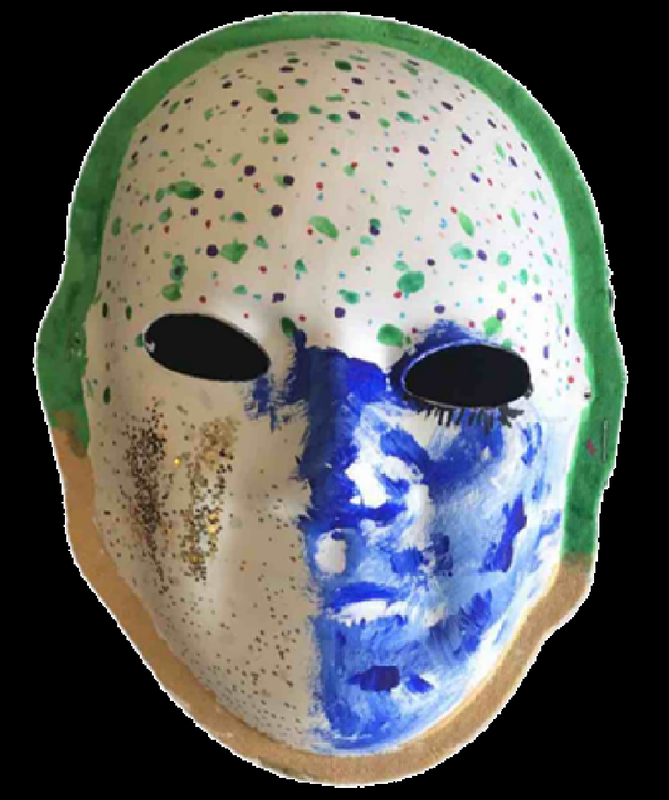 Explanation of Mask: It is basically blue because I am true blue. The butterfly is an element of freedom. The butterfly is there where it landed. 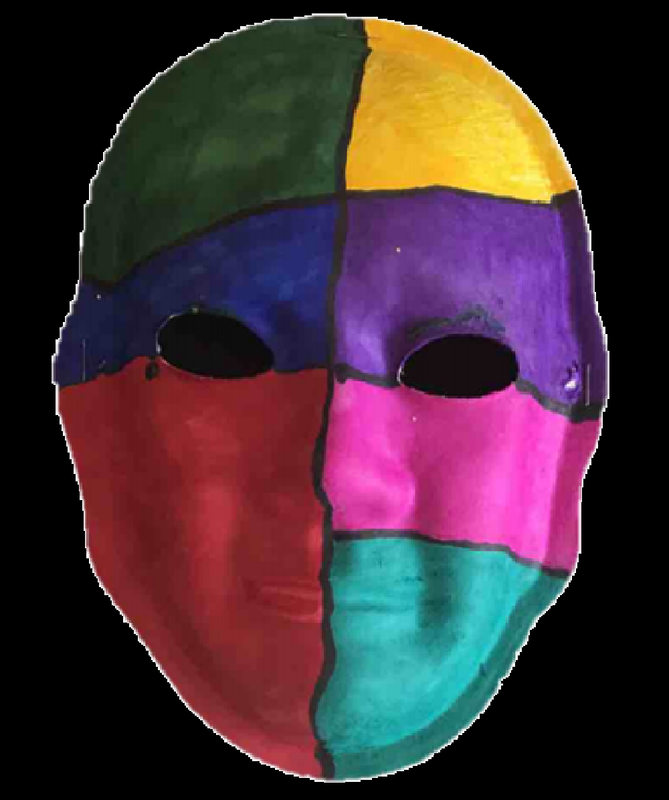 The purple and green is coagulation – like how blood clots. 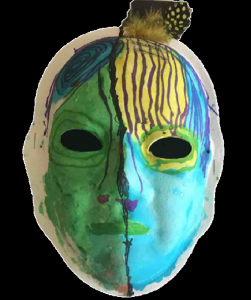 Explanation of Mask: On my mask, I have things I love to do like fishing and biking that I used to do, but for some reason I don’t do it anymore. Fishing means so much to me. 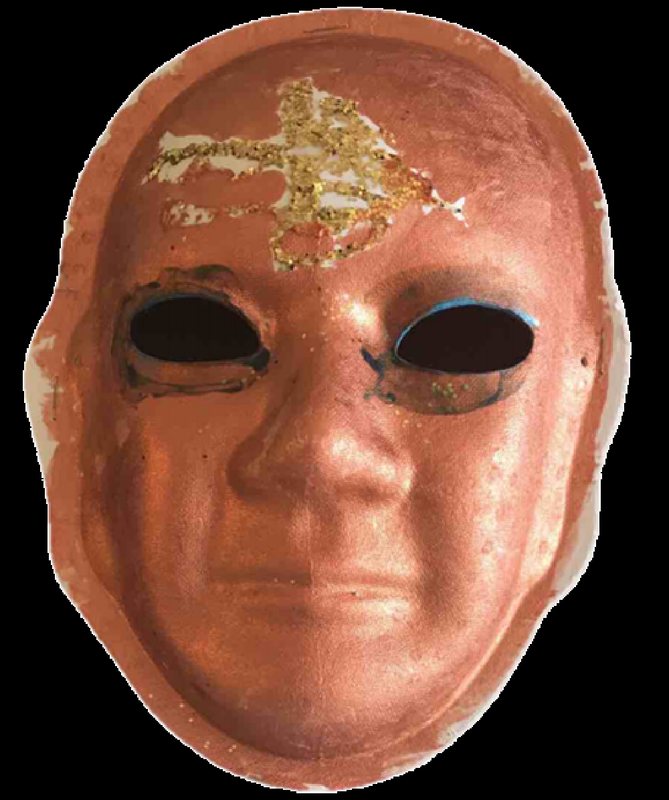 Without the eyes, the mask would be empty because I worry about that. I don’t want to be the mindless grandfather. I feel lucky for the people in my life that care. The mouth displays that I am so emotional – so up and down. The road is the long broken road that is showing what it has taken. I have come far. The gardening and the art is so therapeutic for me. Doing tile work is like art to me. My art work in high school was shown in a case, it is important to me. The traffic is in my head that I sometimes can’t get out of my head – anxiety, worries. The tears is the emotions that come when I can’t control it. I am still looking for the light at the end of the tunnel – sometimes I see it and sometimes it goes away. I feel lucky I get out of the house, even though it is so hard. 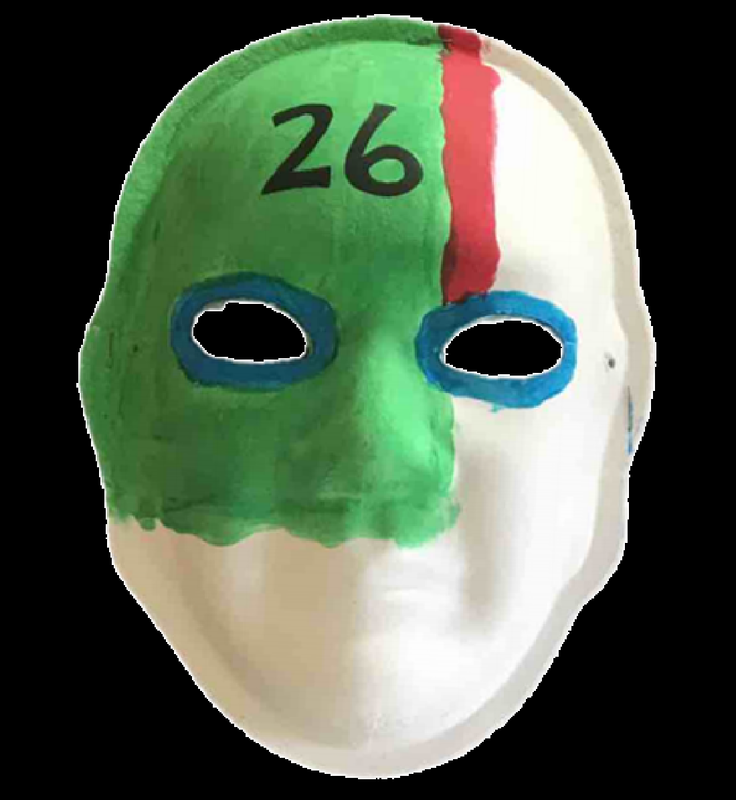 Explanation of Mask: The camouflage represents my military past. The smile represents that I would rather share humor than the pain and anger from my injury. The red heart is the love for my family. Brain Injury: I was walking across a street when I was hit by a car. Explanation of Mask: My brain injury has been my golden ticket. I am 45 years old with a much better story of a second chance to a second life of a richer moments. My sincerity in remembering them is their fingerprints imprinted on my soul. Thank you Ms. Stacie from Brain Care. Thank you God for saving me and filling me with the Holy Spirit. Brain Injury: 1995, while in college, I was hit by a car while walking across the street in the crosswalk in Washington, DC. 2003 I was hit from behind by a NYC transit bus in Brooklyn, NY. 2011 I was hit from behind by a jeep in Houston, TX. I suffered severe concussions in each accident. 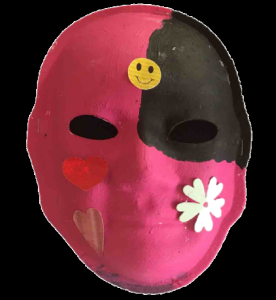 Explanation of Mask: The black represents the darkness that I feel when I’m in that depressed, suicidal state of mind which unfortunately happens quite frequently. The purple represents my power to keep living. I am royalty because I am God’s child. The red represents my family and stability. I have the word “choose” because everyday I choose to live life. I choose to spend time with my mom, dad and friends. They keep me grounded and headed in the right direction which includes my sister and 6 year old nephew. The yellow represents happiness, power and choice. I use the word “Life” with the yellow because I have the power to choose life or death. And I choose life. I have the power to win!!! Brain Injury: I was in a waterskiing accident. I nearly drowned. I have lots of people helping me. 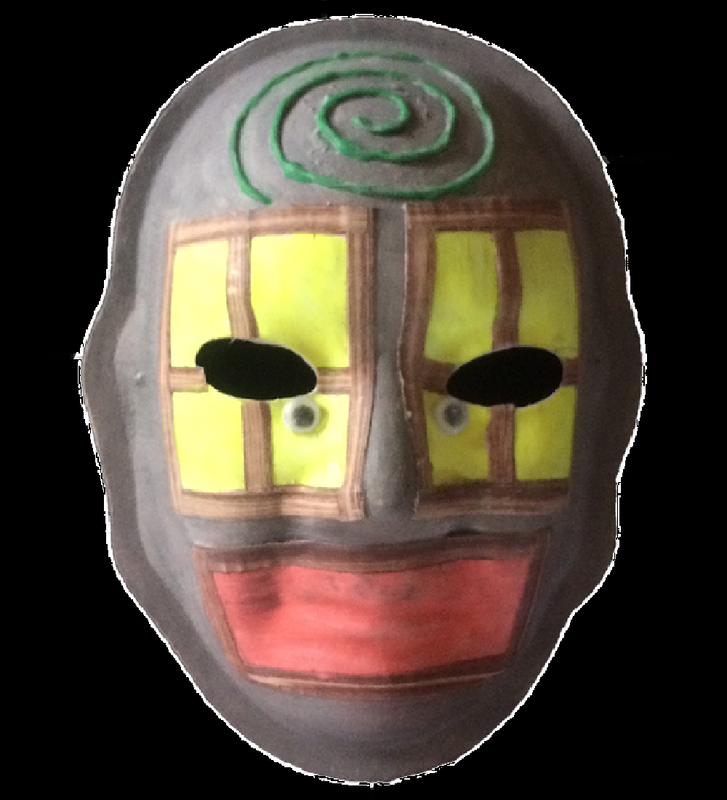 Explanation of Mask: When I look at my mask, it reminds me of memories of places. Germany, a darmstadt in Germany. 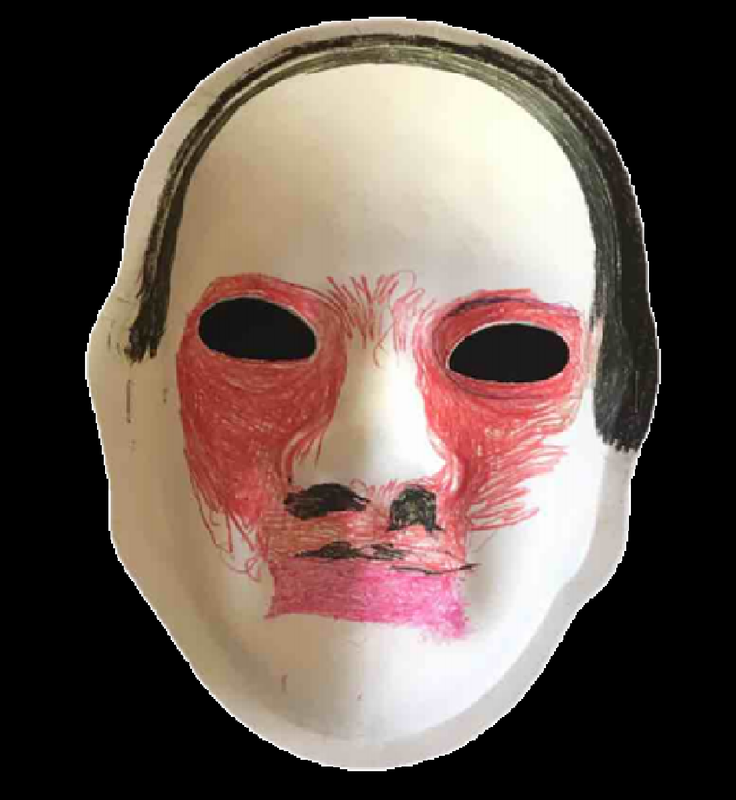 I look at the mask and remember people. I like art. Explanation of Mask: The purple represents my God and my connection. The orange is for my creativity and the sparkles are there because I am sparkly. 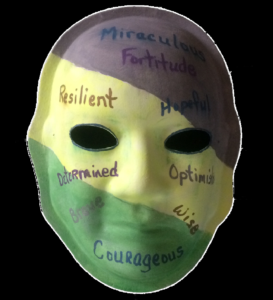 The yellow is that I feel I have the power to be positive and my self esteem is on point. The blue is there because I am truthful when I communicate and I tell it like it is. The dog because I have three dogs who I love so much. The cat because I used to have a cat and I love cats so stinking much. The feather to me signifies freedom from my old self. Brain Injury: I was walking across the street and I got hit by a car and I almost died. Explanation of Mask: I love to ski. Before I used to love to play the piano, now I am very determined to hear what everyone says, because I think before I was injured I didn’t care. I used to think I was in charge. Yellow means happiness. Blue is peace. The green is my brains. I listen to people now, before I thought I was in charge. The red is anger. Brain Injury: Caregiver for my son who had a malignant brain tumor at age 9. Explanation of Mask: I was trying to express the sadness I have felt for many years at what my son has had to endure. As well as the love, joy and happiness I feel of knowing his courage, hope for the future, will to live, and the fact that he has survived this devastating illness. I think I would be forever broken in not for the strength and positive outlook that my son exemplifies each and every day. I am thankful to God for letting me have Zach to care for, even through all the many years of heartache and tears. Brain Injury: Daughter/Caregiver. Briley’s father was assaulted three years ago. He was held hostage for 3 days. The person thought Briley’s father did something he didn’t do, when he found all his belongings he let her father go. Her father ended up with a severe traumatic brain injury. Explanation of Mask: My mask is happy. I am happy my dad is alive. I knew at the age of 5 that something bad had happened to him. I am 8 years old. Brain Injury: Mother/Caregiver. My son acquired a Diffused Axonal Injury from a car accident in the country of Spain. 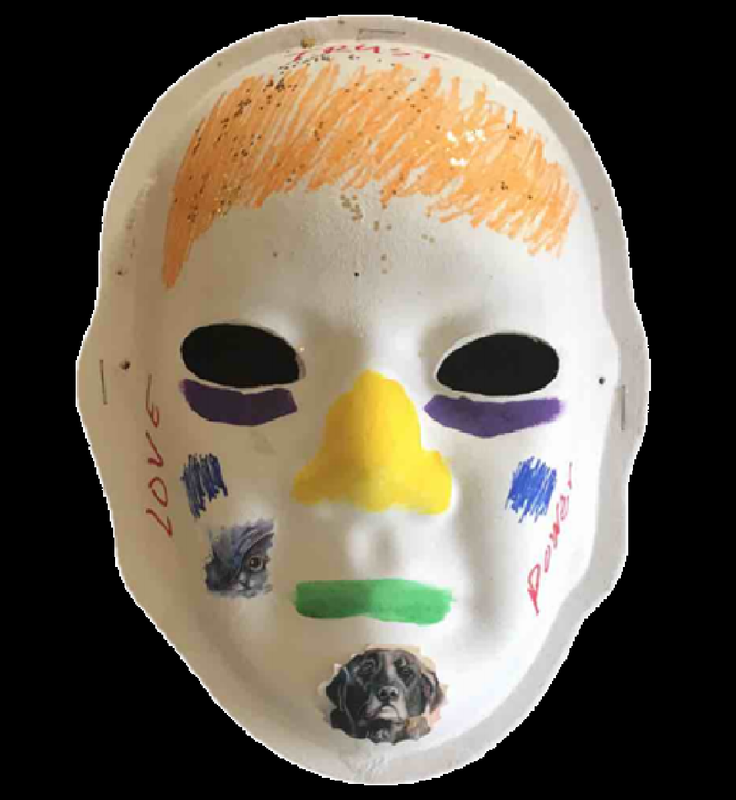 Explanation of Mask: As a mother and caregiver for my son, I wanted to share words that described some of the emotions that I felt as we have progressed through this journey. I got the call that 2 of my sons were in an auto accident in Spain and I needed to get there ASAP. It hit me hard “pow,” there seemed to be a “shockwave” that went through the entire family as well as his friends. 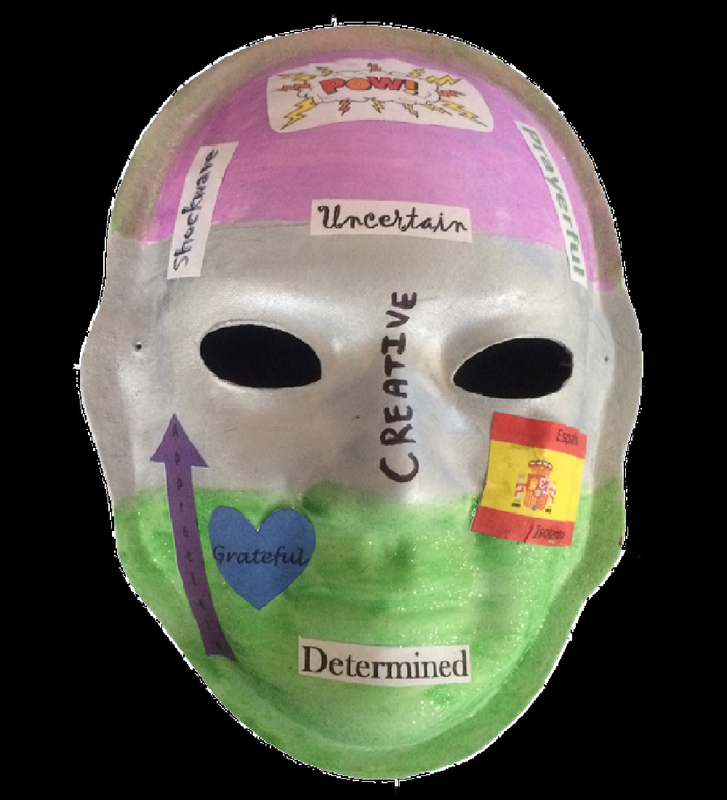 I found myself “uncertain” as to what I would find when I got to Spain because the person calling did not have details. I realized that I would not get through this without “prayer.” So off to Spain I went. I found that if I stayed “grateful & appreciative” for everything, my sons got better and my days were less stressful. 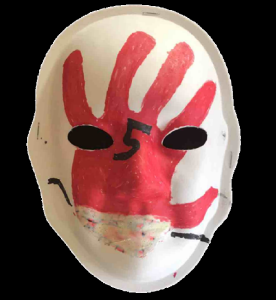 There were times though, during our 5 years there, that I felt “isolated” because of the language, culture barrier, and the lack of friends to chat with. I was “determined” that I would not let their injuries or our circumstances, stop us from having a full life. I “created” joy, and many opportunities to have fun both during our stay in Spain as well as when we arrived back home. Brain Injury: I was assaulted three years ago. I was held hostage for 3 days. He thought I did something I didn’t do, when he found all his belongings he let me go. I ended up with a severe traumatic brain injury from what he did to me. 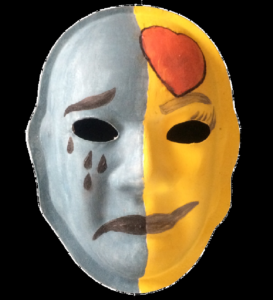 Explanation of Mask: The mask is split in two, 1/4th of it represents how my life used to feel before my accident mentally. The other 3/4ths of it means my feelings that my accident left me with. Afraid, anger, ashamed, calm, challenged, confused, creative, different, helpful, lonely, lucky, nervous, pissed, proud, quiet. Explanation of Mask: I was in an auto accident and I sustained a massive brain injury. My journey has felt long and unending. I have felt like I was a prisoner in my own head. I was not able to communicate clearly so I put bars over my mouth to represent this. 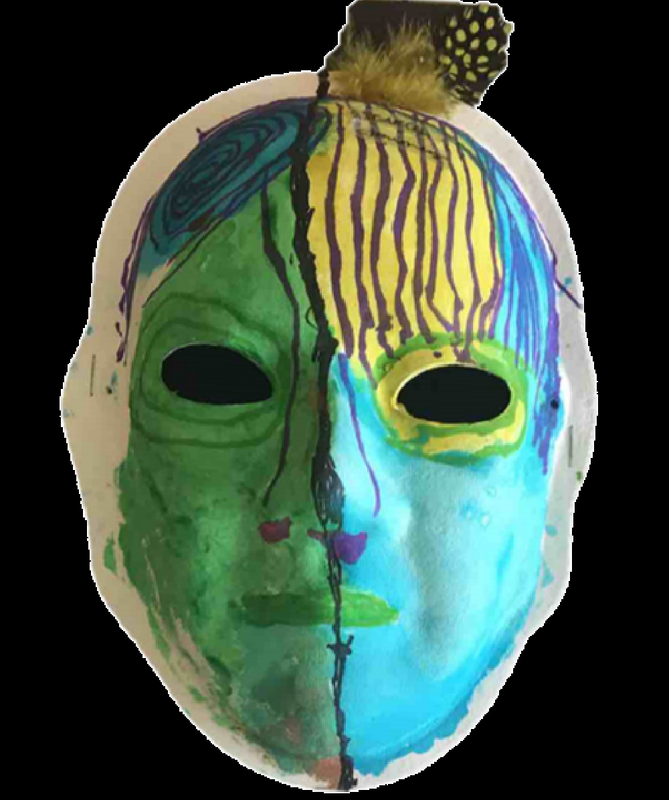 This mask also shows the two parts of myself. 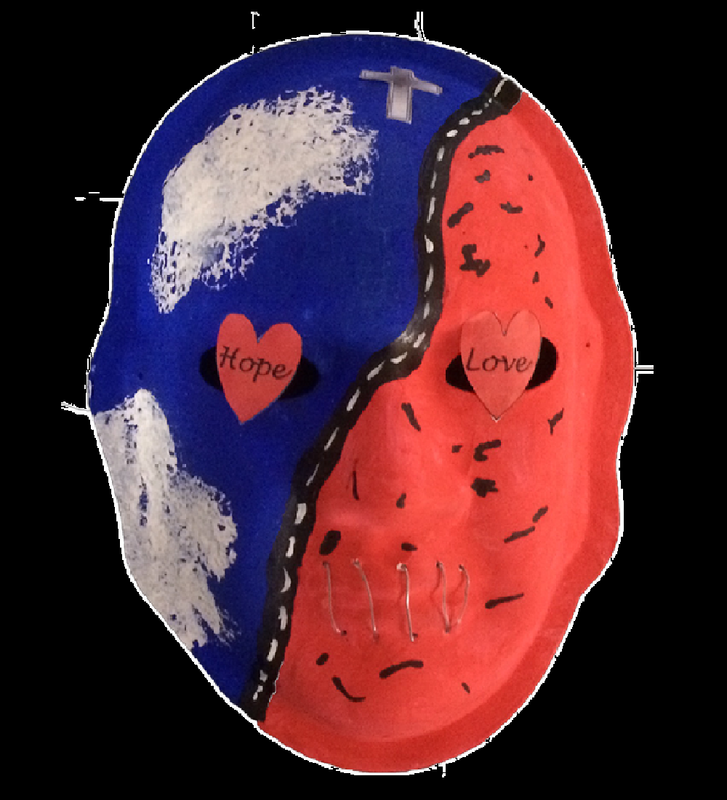 The red side with the random dots show the chaos I feel, and the blue side with the clouds shows the light and hope in God. I have placed 2 hearts over the eyes with the words Love & Hope. This signifies to me that I’m looking through the filter of Love & Hope. Brain Injury: Motorcycle accident July 10, 2007 closed head injury, hit a retaining wall. Explanation of Mask: This mask represents today I am a survivor of Brain Injuries and a Stroke. The left side of my mask represents my faith as a Native American, the colors of life. The right side is the constant need to learn how to accommodate my brain hoping that the dots will find new pathways to learn. The center is my desire to thrive, find balance and energy for each day and to not let the negative tear me apart. Brain Injury: Recovery for Life! 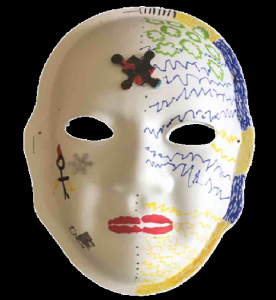 Explanation of Mask: This mask represents my recovery process since my 2007 motorcycle accident and the numerous concussions and a stroke that have followed. The color dots represent my brain in constant repair mode, the arrow is the piercing pain of recovery. The eye presents the fragile hope that I continue to live independently. 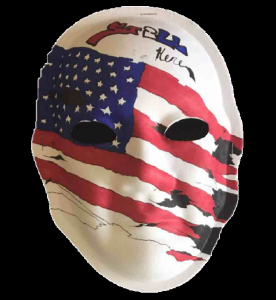 The left side of the mask represents the day I picked my bike from the shop. The colors represent the sunny blue skies, Minnequa Lake, green grass and mountains. 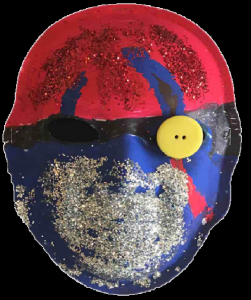 The left eye and the color dots are how my brain was working and reacting to what had occured. The colors of the center and right side represent the impact the accident had on my life. The black eye is the despair, fear and anger I felt as I slowly began to understand that my cognitive, emotional and physical capabilities were most likely changed forever. I forgot to put my motorcycle helmet on. Explanation of Mask: After being diagnosed with a malignant (medulloblastoma) brain tumor at the age of 9 and spending a total of three years of my life (over a 23 year time period) in various hospitals which accompanied 38 brain surgeries, I sometimes look back and feel like I’m watching someone else go through all of that, through a pair of windows, thinking how did I do it all. I also wanted to convey that after being diagnosed with an acquired brain injury, it’s almost like looking out at an empty future. You just don’t know what you can do with the rest of your life. Your window into the future changes dramatically as on navigates through life with a brain injury.